The Didymos Mei Tai / Meh-Dai / (also known as the DidyTai) was re-sized several years ago to accommodate larger babies. Previously, it fit the “average” baby from birth until approximately 12 months of age. The newer version has the same features but with a taller panel which cinches at the seat to fit a newborn babies and adjusts accordingly to accommodate babies up to 35lbs. This is a wonderful carrier from newborn to 2 years, and even beyond! 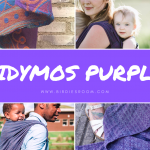 Didymos’ version of the Mei Tai / Meh-Dai is made from the same fabrics as their beautiful woven wraps so there is always a colour and pattern available to suit everyone’s tastes. 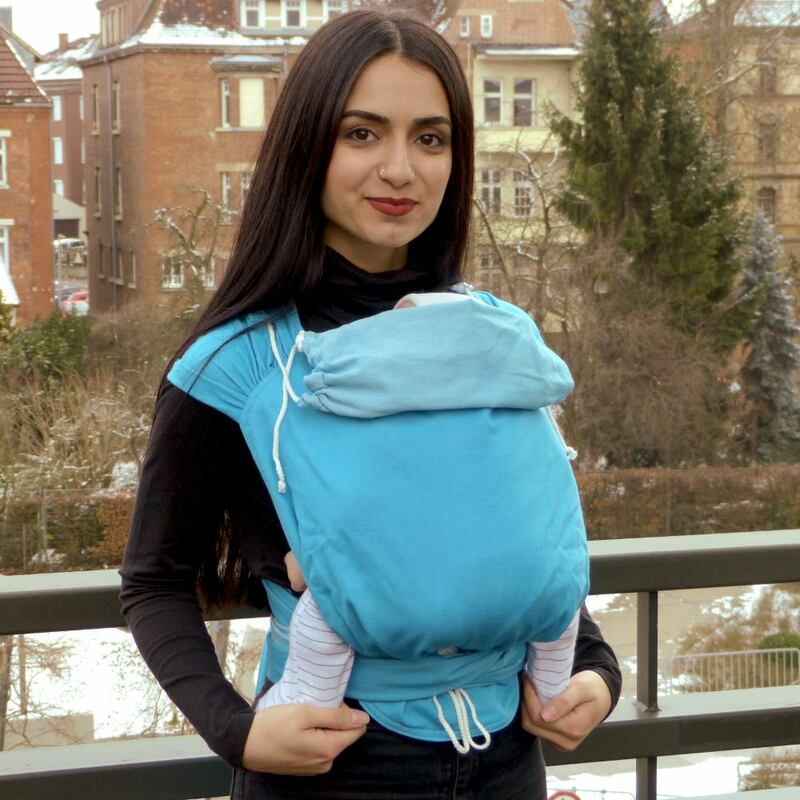 The fabric is purposefully woven for babywearing and moulds to both the wearer and baby for an ergonomic and comfortable carry each and every time. With the Mei Tai / Meh-Dai, there is the added feature of a more structured shape over a woven wrap, for those that prefer the structure. 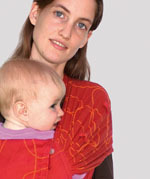 The Didymos Meh-Dai / Mei Tai is an easy to use baby carrier. It is made from a double-layer rectangular piece of DIDYMOS woven wrap fabric, with four straps sewn to its corners. It has no buckles, snap or Velcro fasteners, so nothing that could wear out, harm or wake baby when putting on or taking off the carrier. The top straps are wide and gathered where sewn to the body panel. They tie tightly around the wearer’s shoulders, distributing baby’s weight very evenly. The bottom straps tie together around the waist and provide a secure hold for the baby. The Didy Meh-Dai / Mei Tai supports baby’s optimal and ergonomic spread-squat-position, which keeps any unnatural stress off of baby’s spine and joints and promotes the healthy development of the hip joints. 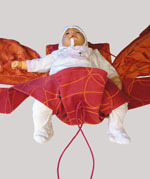 The Didy Mei Tai has a drawstring at the bottom of the panel so that it can be adjusted in width for small babies and re-adjusted as baby grows. It is strongly recommended to only carry baby in the front until baby has developed torso, neck and head control. Once at that stage of development, baby will have met all safety requirements and the Didy Meh-Dai /Mei Tai then makes a great carrier for back and hip carries. The Didy Meh-Dai includes a sleep hood which is a wonderful feature for when baby falls asleep, or for added protection from the weather elements. Simply unroll the hood when needed or when not in use, roll it up to keep it out of the way. The hood can also be used to lengthen the size of the panel for larger babies, offering some extra back support. 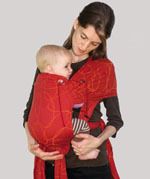 The Didy Meh-Dai is a wonderful option for people that like the idea of a soft structured carrier (a.k.a. SSC, or back pack carrier) but love the feel of a wrap. It is not as versatile as a wrap but is simple to use and easy to learn. It has the benefits of the adjustability and mouldability of a wrap without all the stiff buckles and padding of a soft structured carrier! The Didy Meh-Dai (DidyTai) can be used for a front, hip and back carry. It is important to note that in most circumstances, the baby should have torso, neck and head control before using the hip or back carry. From birth until about 2 years, and even beyond. Specially woven fabric with diagonal stretch for a perfect fit each time, even as baby grows. Free from any toxic materials. Made from pure organic cotton. Made in Germany and Austria. How Does One Use a Didy Meh Dai / Mei Tai (DidyTai)? Carried on the front, right from newborn stage. Carried on the hip, one baby has head and trunk control. 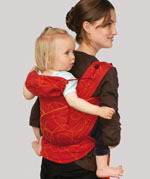 Back position: recommended from six months on Spread the shoulder straps to distribute the weight evenly. Easily adjust the width of the seat for a perfect fit. Sleep hood for head support while baby sleeps. 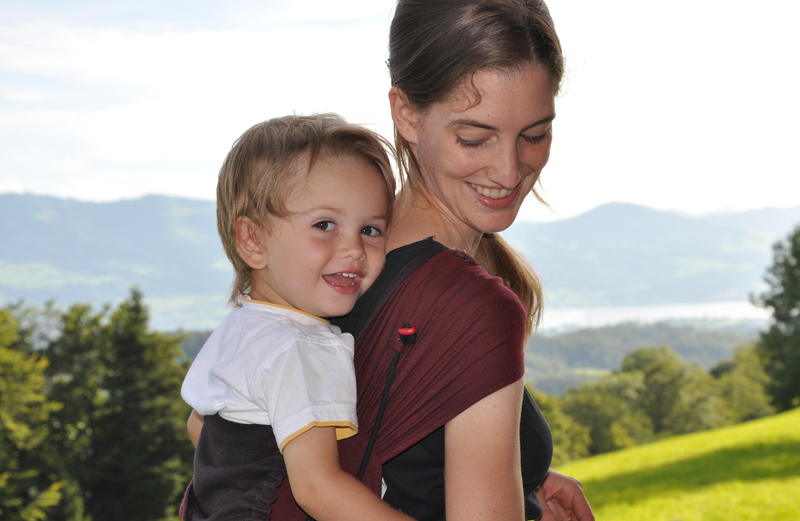 Each Didymos Mei Tai will come with an instructional booklet and how to use the carrier on the front, hip and back. FULL INSTRUCTIONS CAN BE VIEWED HERE. Need some further instruction? Wild Was Mama has as great YouTube video on how to use the Didymos Mei Tai with a Newborn. They also have a video with some helpful Tips & Tricks! 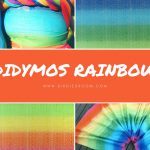 Where Roots & Wings Entwine recently shared her review of the Didymos Mei Tai Silver Waves! The detail and observation in this review is spectacular! 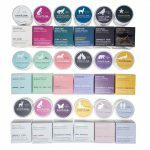 Manic Pixie Dream Mama shared her “before trying-after trying” review on her blog of this wonderful, yet often over-looked, carrier! How do the different weaves in the Didy Meh-Dai / Mei Tai compare? In our opinion, they are all wonderful and are made to carry newborns to toddlers alike! 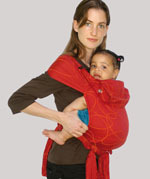 Just like with other carriers, it is a matter of tweaking the carry so it fits just right for both you and baby. We recommend if your baby is small to tie the carrier on apron style (where the with the waist cinched narrow for newborns and if your baby is older, tie non-apron style with the waist un-cinched. Adjust the straps and hood and away you go! 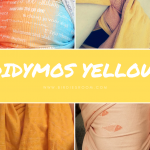 If you want more “geekiness” on how the different weaves compare in the Didymos Mei Tai / Meh Dai (DidyTai), read Carefree Cocoons very informative reviews below! 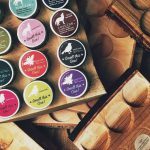 SHOP OUR ENTIRE LINE OF DIDY MEH-DAI HERE!